Acne scars can affect the way we feel about our appearance and our self esteem. How do laser treatments help with acne scars? Active acne is a common skin condition that may lead scar development. If active acne is moderate or severe, then this can lead depressions, pits, and raised skin face. Acne scars can affect the way we feel about our appearance and they can also affect our self esteem in the long term. For patients seeking to reduce the appearance of acne scars, there are a variety of treatments that may help. Scars that are depressed or pitted are known as atrophic scars. These types of scars are commonly seen on the face. Hypertrophic scars are scars that are raised and are typically seen on the the rest of the body. Not every patient who has active acne will will have acne scars. Scars are developed due to poor healing of the wound. When acne breakout, the skin tissue is damaged. Over time, the skin will repair by producing more collagen. If this repair process or collagen production is interrupted or less than optimal, a scar will form. The following are a few risk factors to consider for developing acne scars. Active acne is inflammatory (swollen, red, pustules, painful). Active acne treatment is significantly delayed. The goal of any treatment is to repair the tissue that caused the scar to form. This is done using a variety of treatments. Topical creams that are prescribed by your provider can help repair the skin’s texture and can cal even out skin tone. This is the least expensive treatment options, but it does take a high level of compliance over the course of a year or more. Chemical and mechanical exfoliation works by removing the top layer of the skin which forces the body to create a new layer with better collagen production. It is important to consider that this treatment, like the topical treatment, is lengthy and may take a high number of treatments. This is because the layer of the skin that we are removing is so thin that visually, you cannot notice a difference initially. The exfoliation must be done consistently to compound results over time. 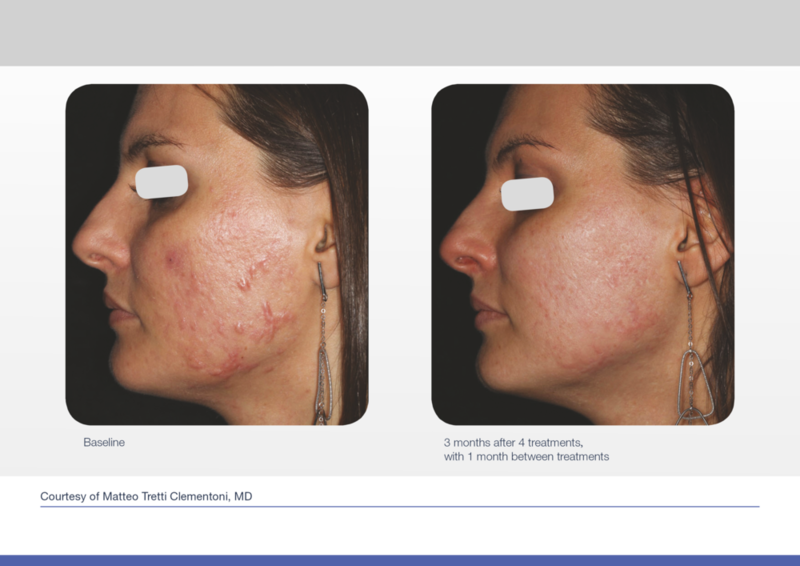 Deep laser treatment for acne scars. Deep laser treatments work by creating microscopic wounds on the skin that contain the acne scar tissue. This tiny wounds are important because it is what triggers the bodies wound response which leads to the development of new collagen and removing the scar. Recall that a scar is formed due to poor collagen production leftover from active acne. By using a laser, the wound is much cleaner, faster, and heals properly. Scar tissue reduction typically occurs within 2-3 treatments. However, it is advised that patients take great care before and after treatment. Any efforts to improve the healing process of the body is recommended. This means topical anti-infection cream, nutrient rich diet, clean skin, and other similar efforts are warranted for success of treatment.